As Atlantic coastlines in western Europe suffer increasingly violent wobble-induced tides, astonished residents are discovering firsthand the power of water on the move. "Will this mean continuous hurricane activity along the European coast? This will be the minor effect, as with an increased wobble the storm surge will likewise increase, sending unprecedented high tides into the lowlands of Europe." A freak wave swept a van into a flooded waterway and the driver escaped through a window moments before the vehicle plunged into the sea. "A rogue wave came out of nowhere. There was a loud bang and the van and I were flipped straight into the river." The van was dropped onto its side, making it impossible for to escape through the door. "I had to escape through the window. I got away from the van as fast as I could as I was worried that the van would be carried into the sea." 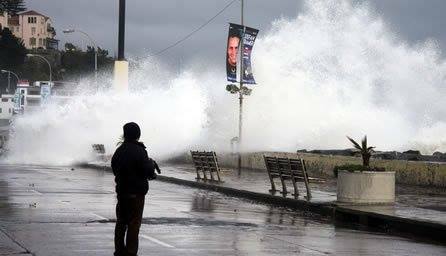 A huge wave crashed over a sea wall in San Sebastian, Spain on Wednesday, sweeping photographers and journalists off their feet. 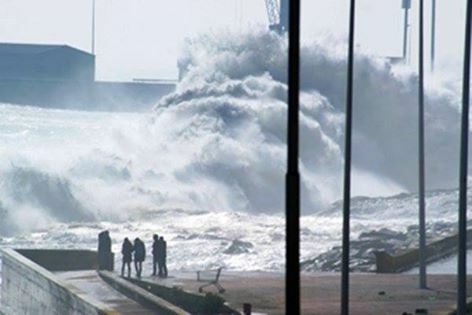 Press photographers and television crews had gathered on the Paseo de Salamanca to record the stormy seas hitting the Bay of Biscay when suddenly the giant wave crashed over the sea wall. Several people were knocked to the ground, including a camera operator from La Sexta TV. She was treated for injuries to her arm and lower back. 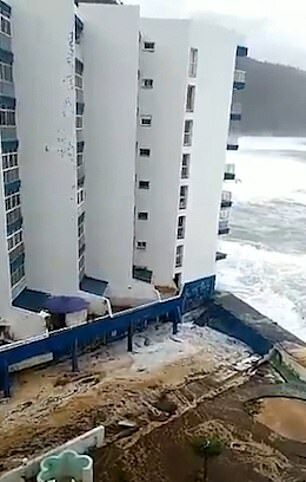 Huge waves have destroyed seafront balconies and reached as high as the third floor of holiday apartments on the island of Tenerife, prompting evacuations. 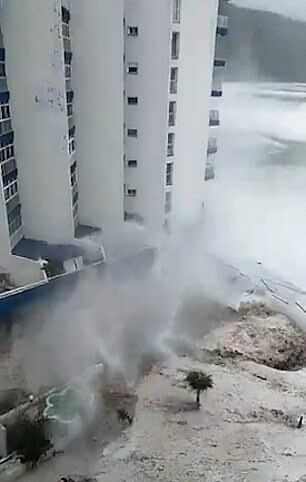 Footage showed waves lashing an apartment block in the tourist town of Mesa del Mar in the north-west of the Spanish island. 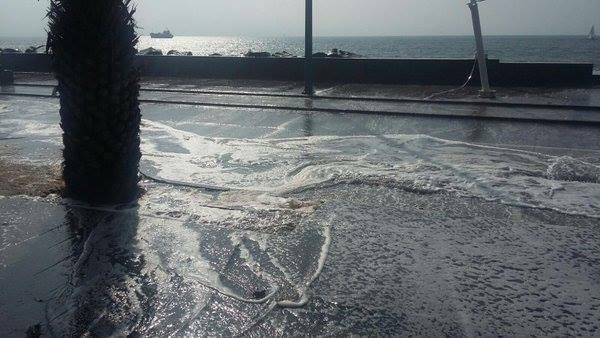 Some 65 apartments in two blocks facing the ocean had been evacuated, according to Alvaro Davila, mayor of the municipality of Tacoronte which Mesa del Mar is part of. It came after regional government officials decreed a state of alert as a fierce storm battered the north of Tenerife and other parts of the Canary Islands. The mayor said no-one had been injured in the scare, which followed the evacuation of 39 people from two buildings in Garichico on the island’s north east coast. The first evacuations were carried out around 10pm last night, with more following around 2am today. Twenty town halls in the region, including the Costa Blanca holiday resorts of Javea and Denia, have announced schools will be shut tomorrow because of the bad weather alert. 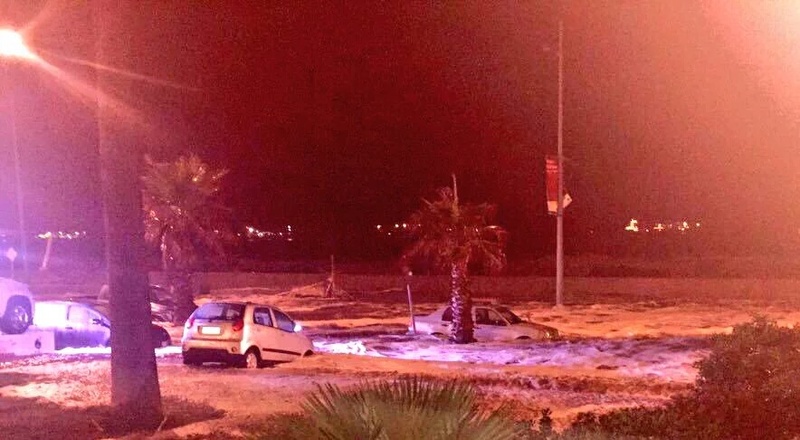 A five-foot tsunami has hit tourist beaches in parts of Majorca and Menorca. A wave measuring nearly five feet hit Ciutadella on the west coast of Menorca early this morning. 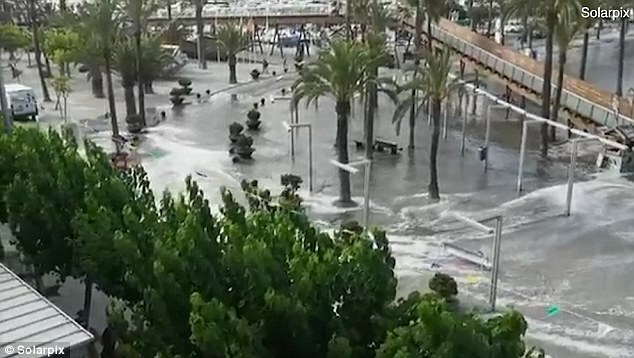 The freak weather phenomenon also affected holiday resorts in Majorca, with seawater flooding bars and terraces by the coast in Andratx and covering beachside roads. Boat owners in the resort on Majorca's south west coast were filmed trying to protect their boats. Beach chairs, boats and parasols were swept away by the waves. A tourist and a local resident died on Spain’s holiday island of Tenerife and another person was missing after a giant wave swept them away from a natural seaside pool, authorities said Thursday. An amateur video of the incident broadcast on Spanish television showed a man running on rocks next to a natural pool as a huge wave crashed down, sweeping him away. It is not known whether he is one of the two dead or still missing. The victims of the incident that took place on Wednesday afternoon in Santiago del Teide were a 35-year-old resident of the volcanic Tenerife island and a 60-year-old tourist whose nationality is unknown, rescue services and local police told AFP. The missing person, meanwhile, is a “young man”, a police spokesman said, without giving further details. “It appears that another person who leapt into the water to try and save them was able to get out of their own accord,” rescue services said in a statement. Tenerife, part of the archipelago of the Canary Islands off the west coast of Africa, is a major holiday destination and its natural, rocky seaside pools a key attraction. Like a tsunami: Giant waves kill 1 and injure 17 in Iran – 5 missing. A group of tourists have gone missing and a man has died after an unexpected tsunami hit Iran on March 19, 2017. 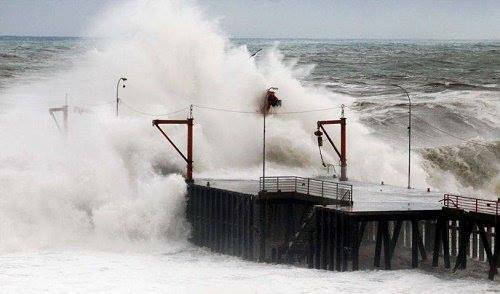 Huge waves battered the coastline of Dayyer in southern Iran and killed a 51-year-old man. An eight-year-old boy from the local area, four Iranian tourists and another 17 people were injured. The freak weather event caused cars to capsize as trees and canopies fell down. The gushing water also tore down tents that had been set up by travellers in the area. 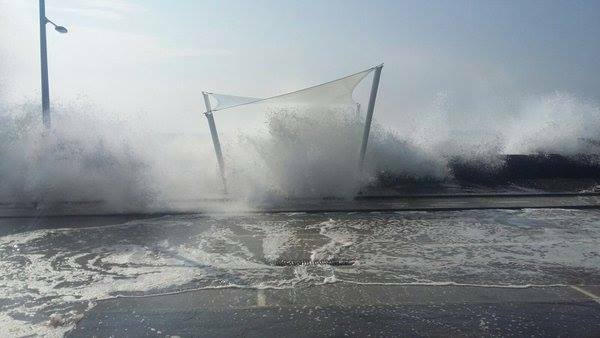 A number of fishing boats also sank as heavy rain and strong winds caused dangerous conditions in the sea, while nearby homes were flooded. Rescue teams, who earlier rescued 10 people from drowning, are now searching for the missing people. One local government official said the incident was ‘never anticipated‘ and ‘quite surprised travelers who had set up their tents on the coast‘. Two tourists are dead after freak waves flooded South Bali, crashing into cocktail bars and infinity pools at local resorts. Two tourists, from Hong Kong and Singapore, died after they were dragged out to sea at Padang Galak Beach in Sanur. 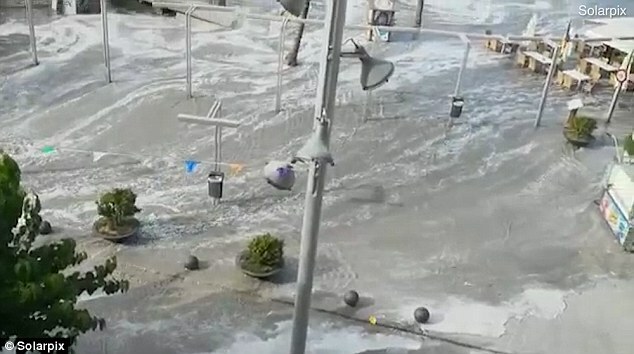 The popular coastal restaurant The Rock Bar at Ayana Resort was damaged and deserted, while Ku De Ta, the most popular hub for Australians partying in Seminyak, was repeatedly pounded with water. 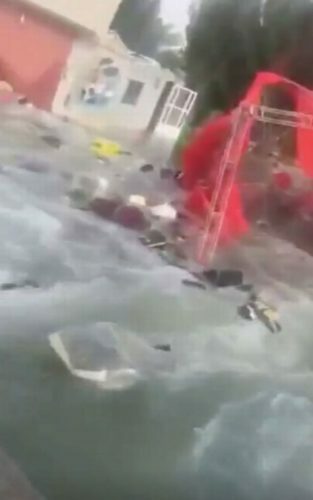 One massive wave almost wiped out Aussies at Ku De Ta, while tourists on a ship were forced to evacuate to the top level as giant waves rocked the massive vessel. Nearly 1300 people were forced to flee Java's Lumajang and Pekalongan cities in recent days, with tidal waves forecast for the next few days in waters off the western coast of Sumatra island and southern coast of Bali and Sumbawa. 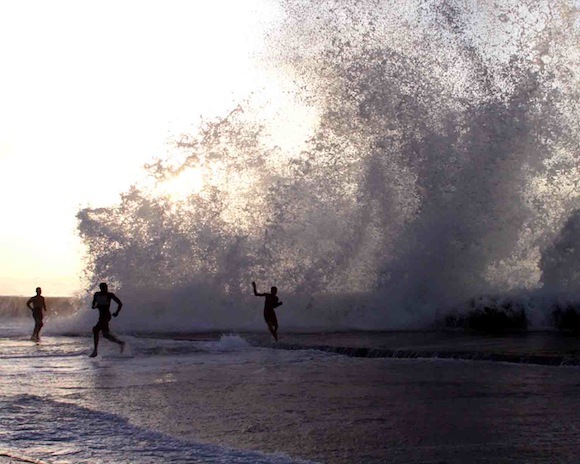 The high tides and freak waves have made conditions dangerous in all coastal areas off South Bali this week, including popular hubs like Seminyak, Kuta and Sanur, with surfers and swimmers in particular danger. Earlier this month, a Perth couple's honeymoon turned into horror when the bride, Lestari Williams from Two Rocks, was among five people swept out to sea who didn't make it back. Brad and Lestari Williams were walking along the beach at Angel's Billabong beach at Bali island Nusa Penida, when a rogue wave swamped them from behind and washed them out to sea. Mr Williams made it back to shore but Mrs Williams and her eight-year-old sister vanished in the surf. 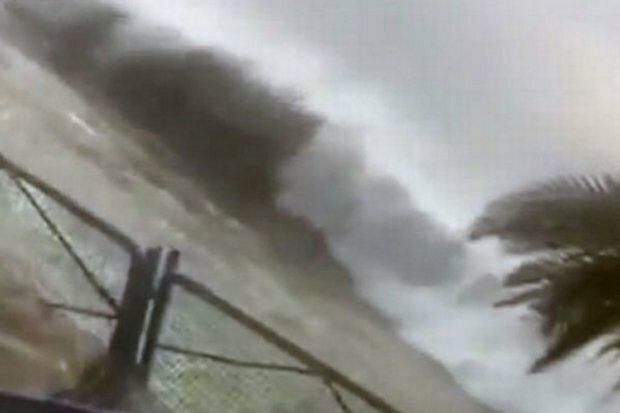 Social media has been awash with terrifying footage of the waves hitting coastal areas in South Bali. "Everything was so calm, so blue & the weather were just perfect. Then a small scale of tsunami wiped our food and our clothes and our hair and everything away." 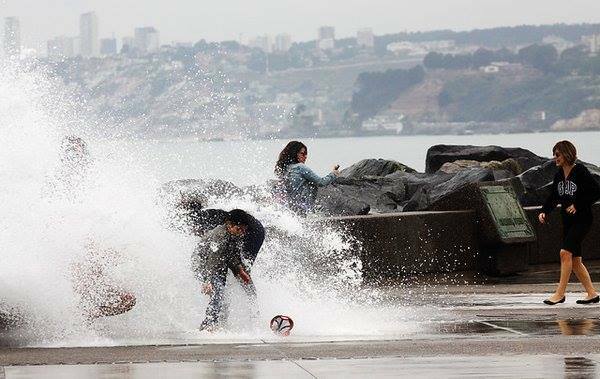 Dangerous and anomalous tidal waves are currently hitting the Chilean coast. The ports of Iquique, Mejillones, Tocopilla, Chañaral, Hanga Roa, Quintero have been closed. The event that started on March 3, 2016, has been classified as anomalous by the National Weather service of Chile. The dangerous situation is enhanced by strong wind blowing offshore which could finally trigger giant and strong storm surges. Numbers of major ports are now closed. The giant waves are now already 4.5-meter high. It’s a real emergency so don’t go out! Waves with up to 70-foot faces rolled into Oahu's North Shore on Monday, forcing an hours-long closure of Kamehameha Highway and damaging homes, according to Hawaii News Now. 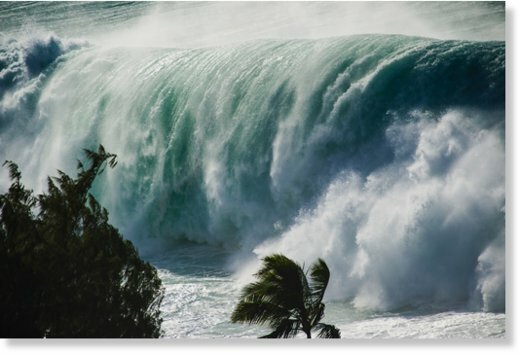 On Tuesday, National Weather Service officials said the swell was one of the strongest surf events in Hawaii in the last 50 years. And, they warned, another swell is on its heels. 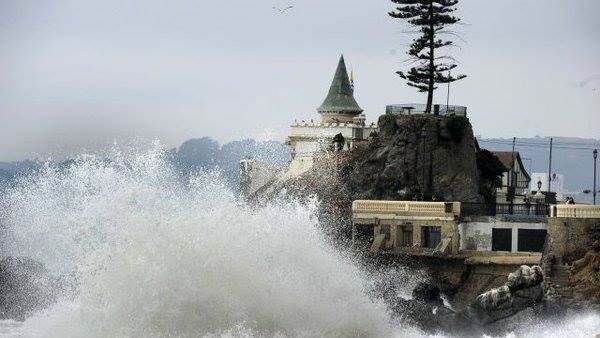 At least one home sustained serious damage from the waves, officials said, and they feared other homes were at risk. Officials also said surf had undermined the foundation of a lifeguard stand at Laniakea. Waves toppled a Haleiwa home's seawall, undermined the home's foundation and washed away a tree. 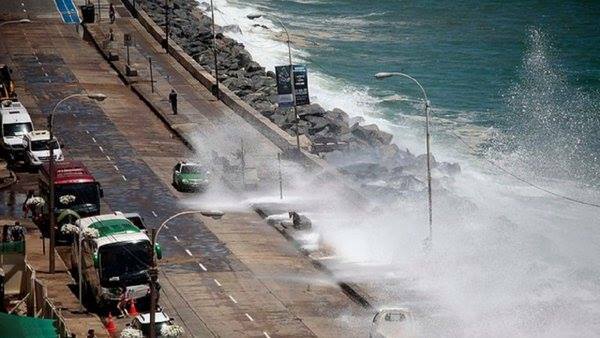 Waves were also showering cars, creating hazardous driving conditions and pushing rocks onto the roadway. Throughout Monday, residents and crews reported coastal flooding up and down the coastline, including at Laniakea and Rockpiles. Residents compare this weeks waves to a swell in 1969, that damaged scores of homes along the North Shore. A High Surf Warning remains in effect for the north and west shores of Niihau, Kauai, Oahu and Molokai, and the north shores of Maui and the Big Island through 6 a.m. Friday. 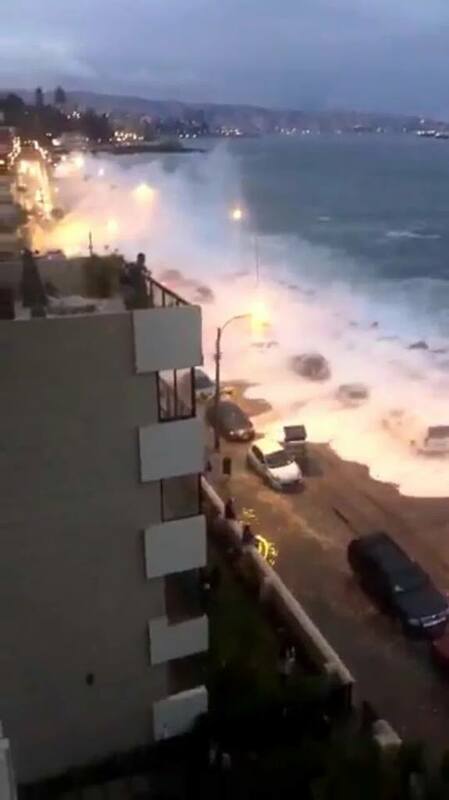 Waves of more than 5 meters are currently crashing on the coast of Chile, particularly hitting the city of Vina del Mar. 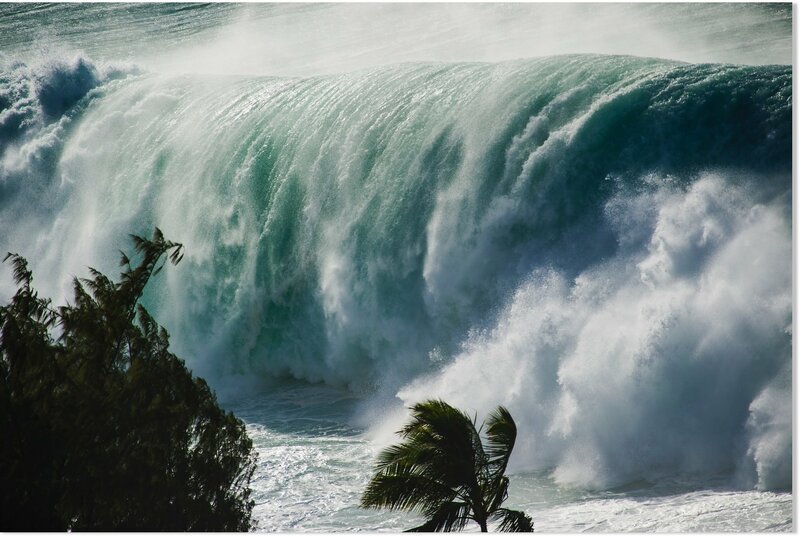 Due to the full moon, swells will intensify on Sunday January 24, 2016. 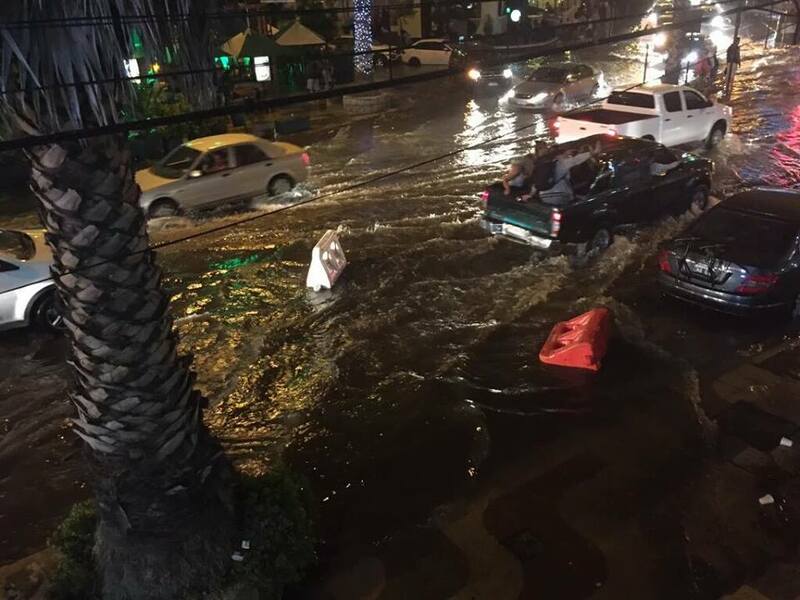 Watch these insane pictures and videos of the giant waves flooding Vina del Mar. A huge wave suddenly overtook an Oregon beach, sending people scrambling to safety. Steve Raplee said he recorded the video not far from the restaurant he owns in Charleston, roughly 100 miles southwest of Eugene, on the Pacific Ocean. "Uh oh, time to go here," Mr Raplee mutters during the video as he pans the coastline before yelling out to the others to "get out of the way!" Frightful screams and a dog barking can be heard in the background as everyone safely scrambles up the dunes. 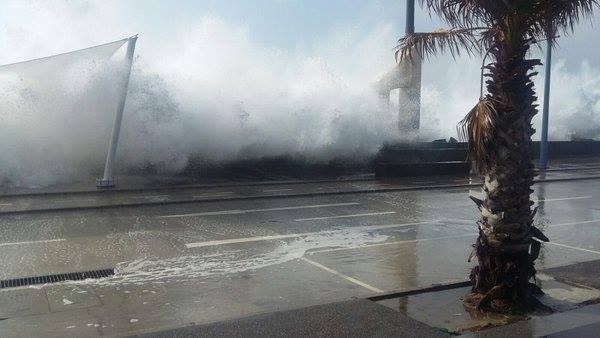 The ocean was so furious that giant waves flooded the Malecon in Havana on January 17, 2016. 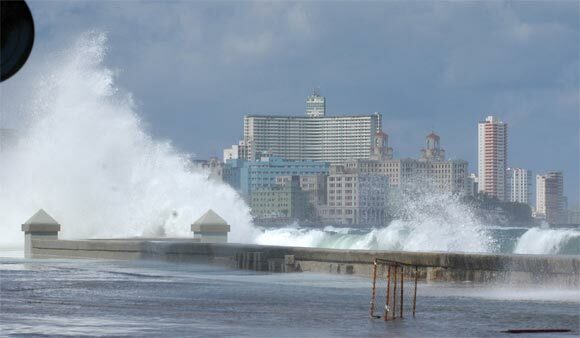 Althoug in the middle of the ocean, such extreme weather is extrememly rare in Cuba. 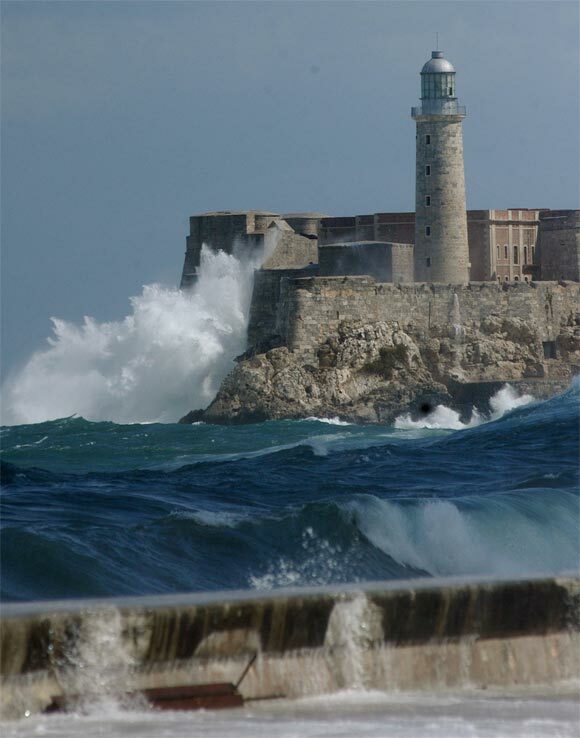 The storm was so strong that the stone parapet could not hold back the assault of giant waves. 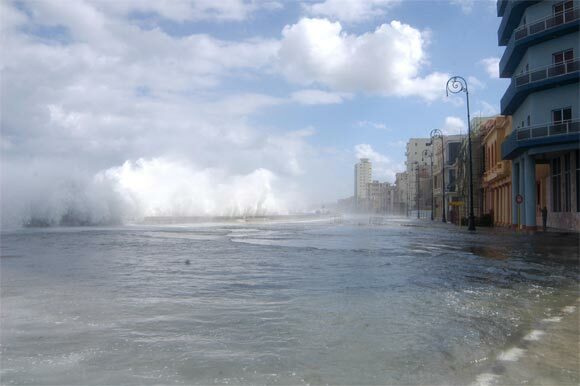 As a result, parts of Havana, the capital of Cuba and some coastal distraicts were flooded.